'Music has always helped me tell my story, and I know that’s true for everyone here,' said the former first lady. Michelle Obama made a surprise appearance to help open the Grammy Awards with host Alicia Keys. 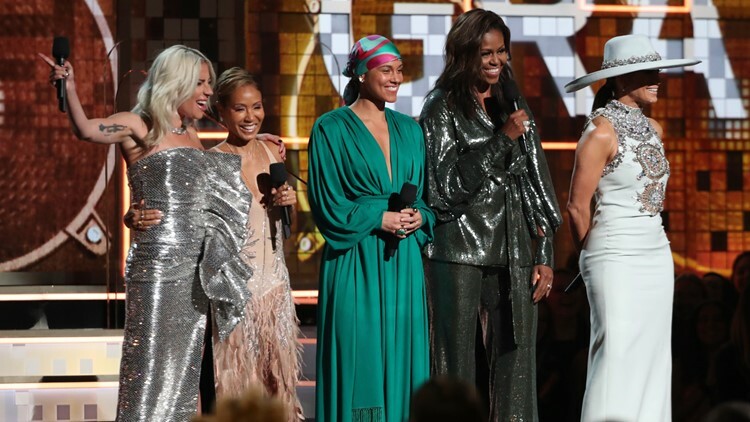 Lady Gaga, from left, Jada Pinkett Smith, Alicia Keys, Michelle Obama and Jennifer Lopez speak at the 61st annual Grammy Awards on Sunday, Feb. 10, 2019, in Los Angeles.